Planning a kids’ Halloween party and stuck for ideas? We’ve compiled a ghoulish list of terrifying treats to whip up a monstrous appetite. Granted, they’re not particularly nutritious, but they’re loads of fun to both make and eat! Hard boil some eggs by placing them in boiling water for ten minutes, then, when the shells are cool enough to touch, crack them all the way round by tapping gently with a spoon. Next place the eggs in a bowl of cool water, add a few drops of red food colouring and leave for about an hour. When you peel off the shells, the eggs will look just like bloodshot eyeballs. For a Halloween treat to make you smile, you’ll need red apples, both large and small white marshmallows (the kind that you sprinkle on top of hot chocolate) and peanut butter. Cut up the apples into semi circular גlip’ shapes then smear on a layer of peanut butter to act as the גglue’. Finally dot the marshmallows along the apple slice to resemble גteeth’, adding גfangs’ in the appropriate places by slicing larger white marshmallows into triangular shapes. If you’re making these snacks in advance, it’s a good idea to sprinkle the apple slices with lemon juice to stop them from browning. This is an easy one. You need a large clear glass bowl, a packet or two of green or red jelly and some chocolate spiders, jelly worms ג or any similar Halloween-themed candies you can find. Simply make up the jelly as per the packet instructions, and then sprinkle in the insects as it begins to set slightly. Particularly if you are using jelly worms, leave plenty sticking out of the top while the jelly sets. The kids will love excavating the creepy crawlies! 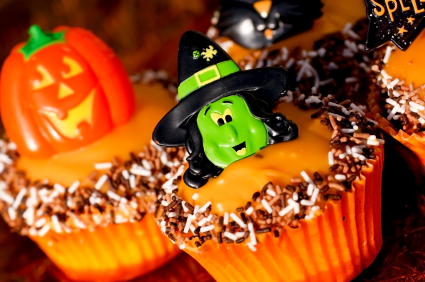 Make up a batch of plain vanilla cupcakes using either green or Halloween-themed paper cases. When they are cool, decorate the tops using orange icing or frosting (use a couple of drops of red and yellow food colouring to achieve the colour). Stick a green iced gem or liquorice allsort in the middle and ג voila! ג perfect mini pumpkins. Boil some frankfurters until they’re cooked. When cool, chop them in half and place a brazil nut on the end of each finger to resemble a nail. Decorate sparingly with ketchup to make a dribble of blood where each finger has been גchopped’. A vegetarian version of this grim offering would use carrot sticks instead of sausages, or alternatively a sweet version can be made using strips of vanilla sponge cake and writing icing. Carefully thread three large white marshmallows on a cocktail stick. Then gently heat some white chocolate buttons in a glass bowl placed above a saucepan of boiling water. Once the chocolate has melted to a thin consistency, dip the marshmallow sticks in so they are covered and effectively stuck together. Set aside to cool, and when the chocolate covering has set, decorate with black eyes and round mouths made of writing icing. Please note Fantastic Fangs and Freakish Fingers are unsuitable for those suffering from nut allergies.